Hope's Cafe: HSH-Fracture Photo Frames-Review and Giveaway!! Today as part of my Home Sweet Home event, I want to share one of my favorite companies with you. Fracture-the BEST method of "framing" and hanging your digital pictures! For all my new readers who may not be acquainted with Fracture, it is basically a frameless glass picture. You upload your picture to the Fracture website, choose a size and shape, add a border if you want to, and then order. Within a couple weeks, you will have a glossy glass photo delivered to your door! The Fracture also includes the mounting piece to hang it on your wall. For my review I decided to use a picture from our recent visit to the Alamo. It's a picture of my Mom, little sister and me standing under an arch of the Alamo outbuildings, and I really liked how the picture came out. It was definitely one I wanted hanging on the wall. So, I used it for the Fracture, and wow does it look good! I chose a border that blends with the picture, and it came out very well. I love the high gloss look, and the ease of hanging. No fussing with printing off a photo and then finding a frame; Fracture does it all for you, and it only takes a minute to mount on the wall! Another reason I love Fracture is the low cost of their products. An 8" photo is only $8.00! I am planning on purchasing at least 1 Fracture for a gift later this year, as I am very pleased with my experience at Fracture! 2 of my readers will win a 14" Fracture!! Go to the Fracture website and tell me which size and shape you would use for your favorite photo! 1 entry-Follow Fracture on Twitter. 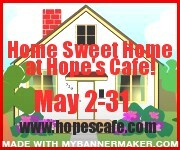 1 entry-"Like" Fracture on Facebook and tell them you entered the giveaway at Hope's Cafe! This giveaway ends Tuesday, June 7, 2011, at 11:59 p.m. Please leave a valid email address in each comment, as this is how the winner will be notified. Winner will have 48 hours to respond, or another winner will be chosen. Giveaway open to US residents only. Disclaimer: I was not monetarily compensated in any way for this post. All thoughts and opinions are mine. All quotes taken from the Fractureme website. I like the 18" Landscape. I'd like the 10" diagonal in the landscape shape. I would do the regular 14" landscape design. Please enter me. Thanks! Follow Fracture on Twitter already. I'd get the 18" square. I'd love to get the 12" landscape size! I would do an 18" portrait of one of my wedding pictures. Thanks for the giveaway! I would like an 18" landscape. Thanks for the review and chance to win. I like their sleek and shiny size. I would pick the 18" landscape. I like the 8 inch diagonal frame. I felt a comment on Fracture's facebook pages. I would use the 14inch portrait. What an awesome idea and giveaway! I think the 12 inch square would make a cute pic. I need to keep this in mind when we move in a while. Like Fracture on FB and told them I entered this here. I follow via GFC ((1955nursehjc4me(at)myway(dot)com)) publicly! #2 Following via GFC ((1955nursehjc4me(at)myway(dot)com)) Thanks! I'm a new subscriber via RSS feed to my Google reader ((1955nursehjc4me(at)myway(dot)com)) Great giveaway, thanks! I would choose the 18" Portrait. Thanks for the chance to win!